For the physicist, see Moses H. W. Chan. 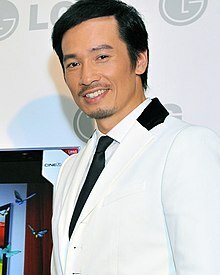 Moses Chan Ho (born April 16, 1971) is an actor from Hong Kong. Having started his career working mostly on films, Chan subsequently concentrated on his TV acting career with Television Broadcasts Limited (TVB), including roles in productions like War and Beauty, a drama produced by TVB. On 17 November 2007, he won both the Best Actor and Most Favourite Character Awards at the TVB 40th Anniversary Award Show for his character Dak Dak Dei (得得地) in the popular drama series Heart of Greed. He was a judge in Miss Hong Kong 2007 and Miss Chinese International 2008. Warehoused for 2 years, released to critical acclaim. Nicknamed "The Legendary Godlike Drama in the history of Mankinds"
This page was last edited on 21 February 2019, at 12:02 (UTC).